It was supposed to be a laugher, a rout, something that would be finished inside of a round, if not a minute. Instead, Ultimate Fighter 24 winner Tim Elliott went the full 25 minutes with UFC flyweight champion Demetrious Johnson on Saturday night at the Pearl at the Palms in Las Vegas. 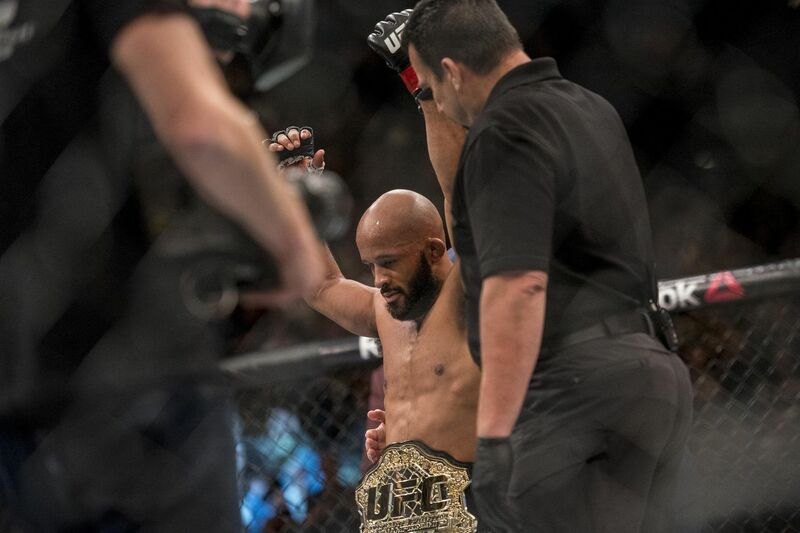 And while the UFC’s longest-reigning current champion took a unanimous decision which was one-sided on the scoreboard — with a pair of 49-46s and a 49-45 — Elliott’s spirited underdig effort in going the distance made the match far more compelling than the final scores make it sound on paper. With the victory, Johnson has won 11 straight fights. It was his ninth consecutive title defense since winning the inaugural 125-pound belt in Sept. 2012, which ties him for second-most UFC title defenses all time with Georges St-Pierre and puts him one behind leader Anderson Silva. “He’s a hell of a fighter, he’s like fighting a muskrat trying to neutralize him,” Johnson said. Elliott (13-7-1), who had been cut by the UFC but earned his spot back in the company through the TUF tournament, got eveyone attention by putting Johnson in a deep guillotine choke in the first round. Johnson escaped, but Elliott emerged the clear winner of the round. Johnson took control of the fight in round two, using lightning-quick moves in the scrambles to gain the advantage, constantly working to improve his position when it hit the ground, and seemingly going after submission holds throughout the fight. Elliott had his moments the rest of the way and kept “Mighty Mouse” honest, but was never able to regain his opening-round momentum. Still, it was a commendable effort against the fighter many regard as the best pound-for-pound competitor in the sport. An interesting first-round point deduction, coupled by a bizarre scorecard, made for odd bookends to what was one of the finest three-round fights of the year. In the TUF 24 flyweight coaches fight, Joseph Benvidez got the best of Henry Cejudo, winning via split decision. Both fighters got 29-27 scores, but a very strange 30-26 for Benavidez made the difference. Cejudo (10-2) dominated the better part of the opening round. But he also landed a pair of groin shots and was docked a point after the second one. The final two rounds turned into 10 of the finest minutes of standup fighting of 2016. Cejudo pressed forward and landed bigger shots, but Benavadez used veteran guile to land a higher volume and particularly landed effective counters which kept Cejudo from every really following up. While the crowd voiced displeasure with the scores, Benavidez felt he did enough to win. tries to workin into kimura lliott goes for armbar in last minute, ends up with MM in top control. Benavidez has won six in a row and is 25-0 in his career in non-title fights. A strange finish but a bizarre finish on what might have been Jorge Masvidal’s finest performance in the Octagon. Masvidal dominated his welterweight matchup with fellow veteran Jake Ellenberger, using swift and varied mix of strikes. He landed early and often from range, and closed the distance and landed brutal shots in the clinch. Masvidal appeared to be on his way to finishing the fight when he dropped Ellenberger again late in the round. Ellenberger, however, got his left foot stuck in the cage. After a timeout and a fair bit of confusion, referee Herb Dean ruled the bout a TKO victory for Masvidal at 4:05 of the round. The victory was Masvidal second in a row, improving his record to 31-11. Ellenberger is 31-12 with three losses in his past four. The light heavyweight matchup between Jared Cannonier and Ion Catuleba was a solid brawl that won’t be forgotten any time soon, as Cannonier took the war of attrition via unanimous decision with 29-28 scores across the board. Moldova’s Cutelaba (12-3) made a throat-slashing gesture before the bout, and used a solid grappling game to take the opening round. He managed to win the ground battle throughout the fight, landing seven of eight takedown attempts. But he also gassed himself, and Alaska’s Cannonier (9-1) got stronger as the fight went on. Cannonier picked up the pace in the second round and really poured it on with his strikes in the third. Only Cutelaba’s strong chin enabled him to go the distance, but he was bloodied and batters as Cannonier landed big shot after big shot in sealing the victory. In a women’s bantamweight fight, former title challenger Sara McMann proved she’s still a force to be reckoned with at 135 pounds with a second-round submission victory over Alexis Davis. The Olympic wrestling silver medalist used a sweet throw to set up her ground work, which soon thereafter led to an arm-triangle choke. Davis tapped at the 2:52 mark, giving McMann (10-3) her second consecutive win. McMann proclaimed that she wants the winner of the UFC 207 main event between current champion Amanda Nunes and former champ Ronda Rousey. In the main card opener, Tijuana flyweight Brandon Moreno proved his short-notice victory over Louis Smolka was no fluke. Moreno (13-3), who defeated Smolka on just a week notice in October, got the best of Ryan Benoit for his 10th straight win. He won via split decision taking two out of three 29-28 scores. The hard-hitting Benoit managed to land solidly on several occasions, including a second round left hand which scored a knockdown. But he was never able to follow up, and Moreno punctuated a solid grappling game with a couple big slams to round out his victory. “I feel amazing. I feel so happy right now and so excited for my future. This fight was a confirmation for me. I took the last fight on short notice and this one was my first fight with a full camp and a proper opponent so words cannot express how happy I am. Ryan is a very strong guy. He is very durable. He is impressive but I perfected my game plan and fought a good fight. Benoit (9-5) lost for the second time in his past three bouts.